If your family is anything like mine, you’ve got stuff. Stuffed stuffs that keep multiplying in your house like rabbits because your kids seem to collect anything soft, squishy and stuffed. 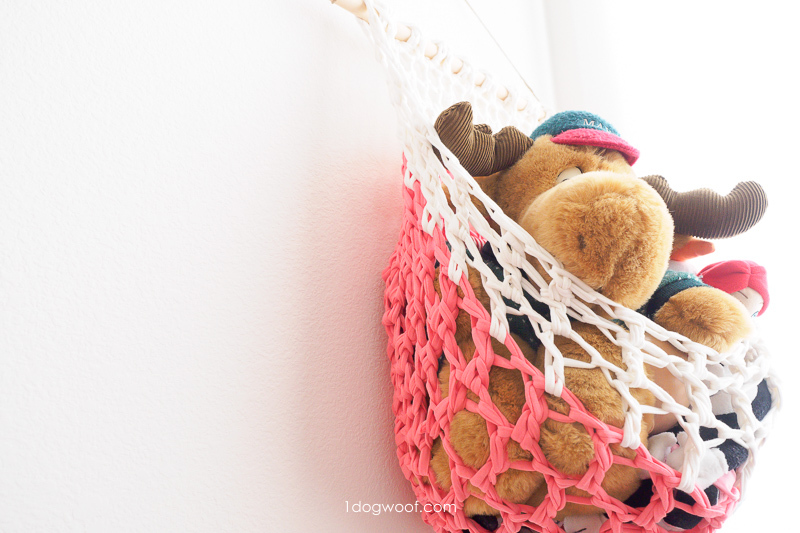 And even if you didn’t have mountains of stuffed toys, I bet you’ll have something you’ll want to store in this modern and clean looking t-shirt yarn hanging basket. Because, seriously, who doesn’t have stuff? As with many of my designs, this project came about because of a problem I needed to solve – the ever increasing number of stuffed toys in my house. Ok, I admit, I’m not helping the problem by creating some of those stuffed toys, like sharks, unicorns, whales, bunnies and jellyfish, but still, there’s just a lot of them, and they need a home. Or rather, they need a new home since they no longer all fit in the huge laundry basket I had originally set aside for them. I looked for hanging toy storage options online, but couldn’t find anything that hung on a flat wall, not stretched across a corner. When I can’t find anything suitable, I make my own. I looked in my stash, found some gorgeous fabric yarn from Wool and the Gang, and solved my stuffed toys problem in a weekend. Fabric yarn is not all equal, and I don’t mean quality. Fabric or t-shirt yarn, by definition, is made from fabric remnants, so every skein will have different thicknesses and weights. The yarn isn’t the same thickness all the way through either, even though it’s considered a super chunky weight. Since each skein is measured by weight, the yardage in each skein will also differ. 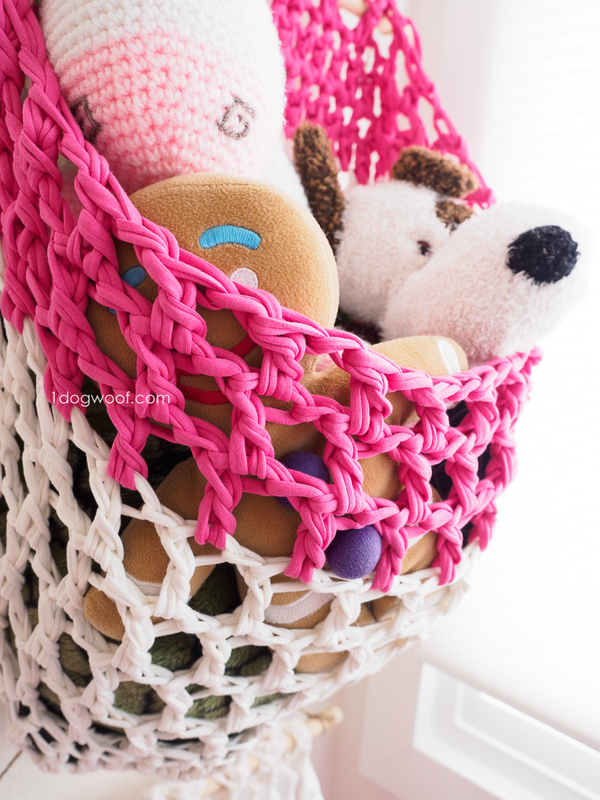 Basically, you never know what you’re gonna get, so have plenty on hand, or make fun, easy, mesh-y projects like this basket, where the weight, thickness and length don’t matter too much. My first basket was made from Wool and The Gang Jersey Be Good fabric yarn, and the bottom coral part of the basket was much thicker than the top, white yarn. The second basket was made from leftovers from my Sirius Star pillow, and the same white yarn from Wool and The Gang. This time, I used the lightweight white yarn as the bottom of the basket and the thicker fuschia yarn on the top. 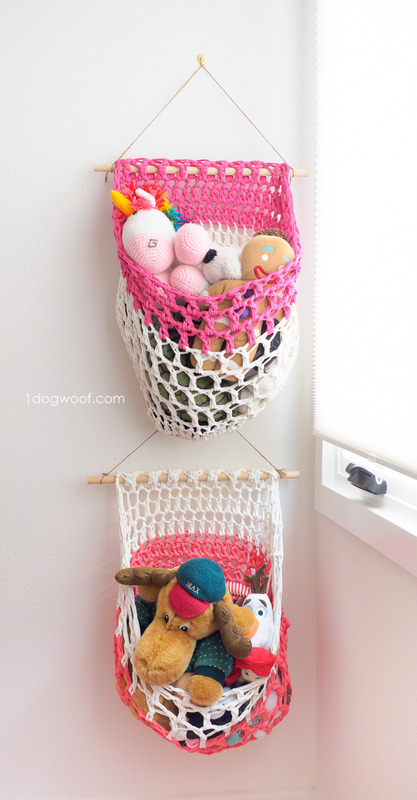 The second basket, with the heavier yarn on top, hangs better and keeps more stuff in than the first basket, whereas the white yarn on top doesn’t support the dowel as well and causes the basket opening to over-stretch. You want the over-stretching at the bottom of the basket, where all the goodies are! 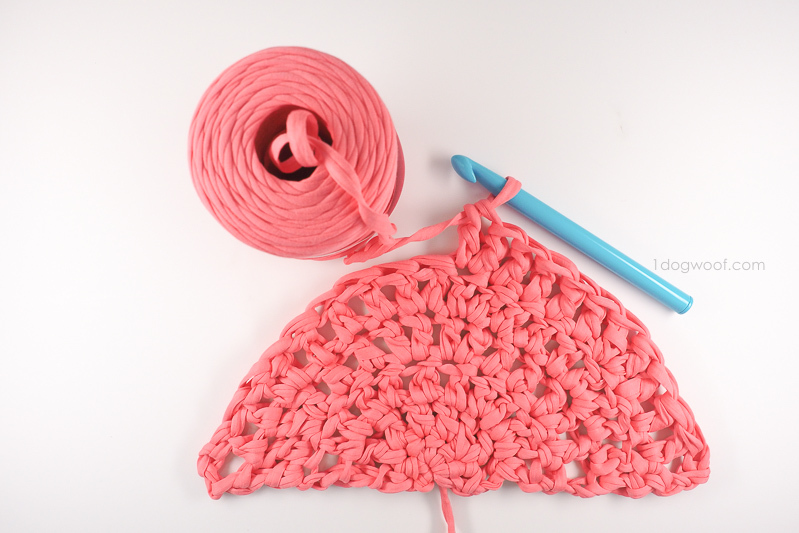 Lesson is, if there is a weight difference in your two balls of fabric yarn, use the heavier one as the top portion – it supports the dowel and gives the basket more structure. Live and learn, and pass on the knowledge. Unlike other hanging baskets you may have seen online, this basket is actually half a cylinder, versus a full cylinder basket. The bottom is a semi-circle, and then you work a straight back for support and mesh sides for stretch. String a dowel through the back to help the basket lay flat against the wall. You can imagine this as Santa Claus’ belly as he’s ho ho ho’ing his way through the toy workshop! 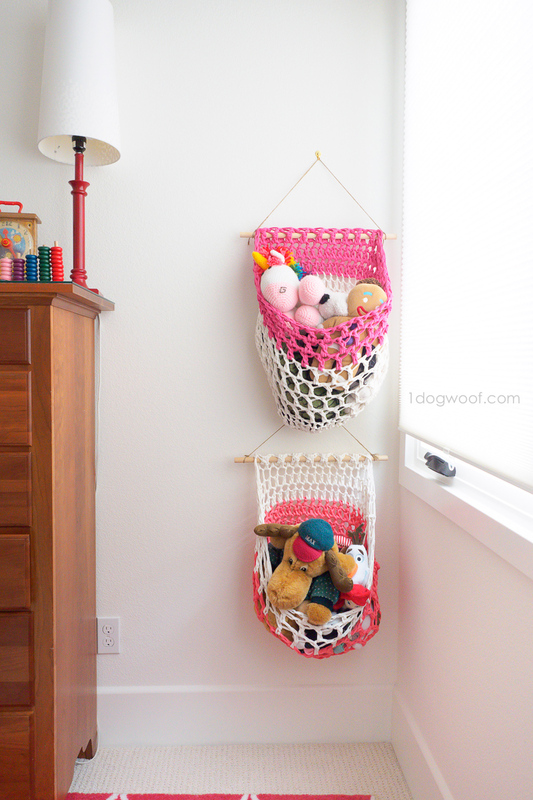 The dowel also helps keep the basket open so it’s easy to get toys in and out of the basket. I made two, hung them up in the kids room, filled them with stuffed animals, and was finally able to see the floor of their room again! All chain 3s and chain 4s at the beginning of a row/round count as a stitch. The bottom of the basket is a semi-circle, worked in rows. The walls of the basket is worked in rounds, with the curved part using a mesh stitch and the flat part worked in straight dc stitches. Round 1: Ch 4. Skip same st as chain. Work 1 dc in next st. Work [ch 1, skip 1 st, dc in next st] 15 times. Work 1 dc in same st. Work 15 dc evenly across flat edge of semi-circle. Join to 3rd ch with sl st to close the round. Round 2: Ch 4. Skip same st as chain. Work 1 dc in the dc from previous round. Work [ch 1, sk 1, dc in next st] 15 times. (Each dc is worked into the dc from the previous round, not into the chain space.) Work 1 dc in each of next 16 st. Join to 3rd ch with sl st to close the round. Rounds 5-7: Repeat Round 2. Cut a 1/2″ dowel about 18″ long. Thread the dowel through the last 17 dc from the final round. 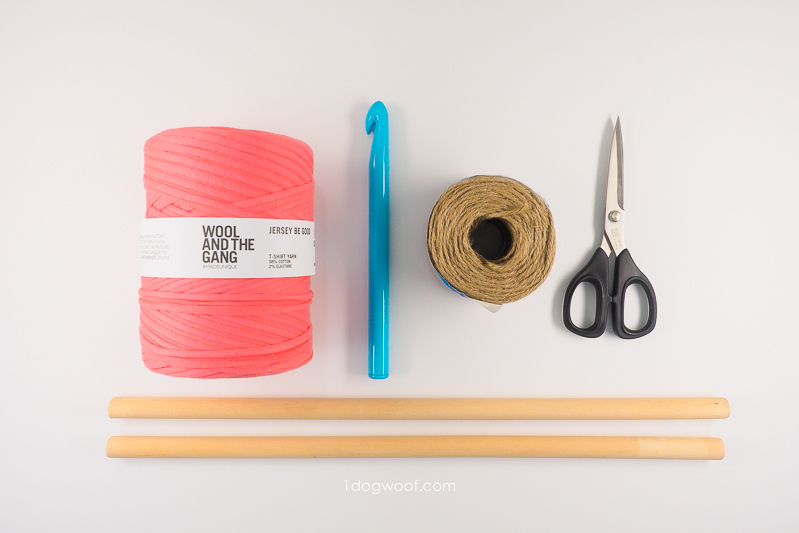 Tie twine on either end of the dowel and hang on a sturdy picture hanger. You can see from the photo above that the fuschia one hangs better, but having the low hanging coral basket worked out for us, since the little one can reach that one a lot easier. Will you be putting toys into your hanging baskets, or something else? 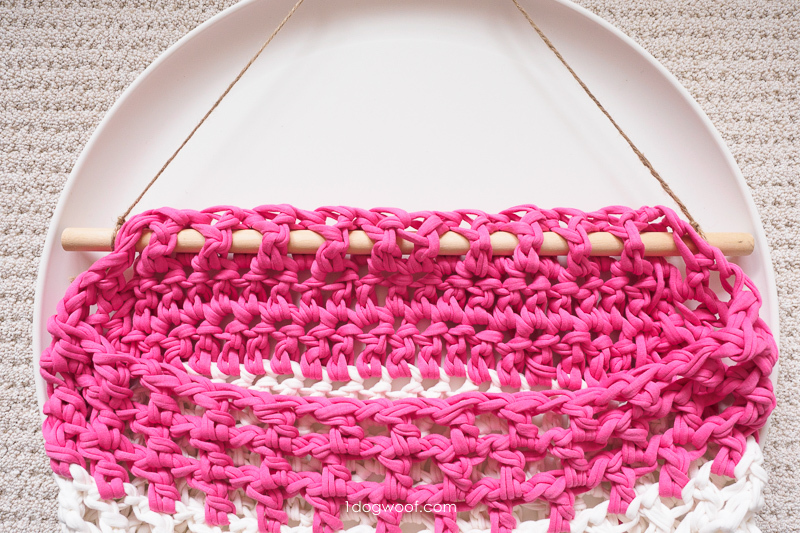 I can see a plain white or neutral basket hung in a bathroom to hold toilet paper or small towels, or ooh ooh, a t-shirt yarn hanging basket in your craft room to hold leftover yarn! How meta. I love this idea! Thank you for sharing! It’s a great way to store things in the corner. Gonna try it! We are a t-shirt yarn producing firm in Çerkezköy, Tekirdağ. Our factory is about 75 km to Istanbul Ataturk Airport, our capacity is about 50.000 kgs/month for basic type. We sell with our brand , we also produce for some other brands. Our products are recycling products, hand-knitting rope bobbins about 1-4 cm wide and weighing 650 to 750 grams. Our products are in daily t-shirt format and the content of the product may vary. Since our products are recyling products we don’t have any colour shade card . We have 13 main colours which are black, white, light gray, dark gray, navy blue, yellow-orange, blue, green, red, brown, patterned, purple and pink. Order amount is proportioned to the main colour groups. In the colour subgroups, a proportion is made from the colour tones that are currently available. As they are recycling products, there is no colour guarantee. It is nat up to chance to find the same colour tone in the next order. On pallet loadings 100x120x180 cm3 pallets contain 936 products. On bulk loadings, 20′ containers can take 10 000 – 12 000, 40′ containers can take 40 000 – 42 000 products. Minimum order quantity is 2 pallets. (1872 coils). You can find the packing form in the attached file. The images of our other products are also in the attached file. Please specify your order quantity for the product price. 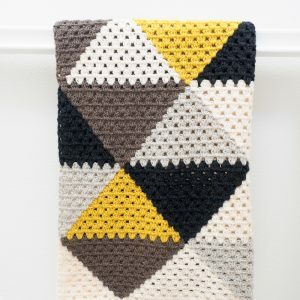 I am a practiced crocheter but am confused by the instructions. In Round 1, what do you mean by “Work 15 dc evenly across flat edge of semi-circle. Join to 3rd ch with sl st to close the round.”? What is the flat edge and to which 3rd ch does one slip stitch? I hsve attempted 3 different ways and none of them work to close this into a round and create a pouch. Please clarify. Thank you. Thank you for sharing this! I’ve never worked with t shirt yarn but I want to. This would be great for my kids! Why is there a Round 1 after Round 8? The numbering confuses me… Great idea, though! I really want to try it! I just want to make sure I have the idea down first before I begin.